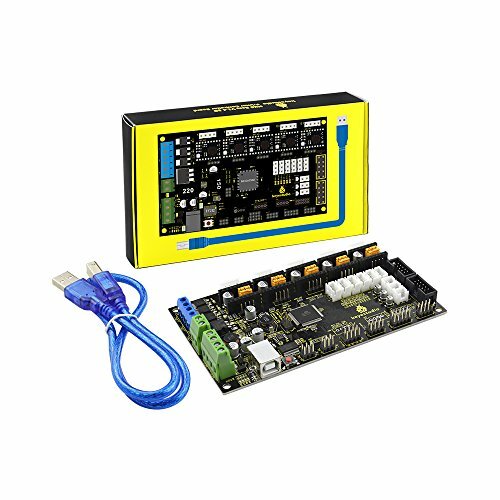 Keyestudio 3D MKS Gen V1.4 printer motherboard control board combines and improves the assets solution of the RAMPS 1.4 and Arduino Mega 2560 board on a fantastic single board. Keyestudio 3D MKS Gen V1.4 printer motherboard control board is an optimal 3D printer controller solution for your Reprap 3D printer. Integrate 2560 and ramps1.4 in a board, to solve the complicated interfaces and broken problem of Ramps1.4 combination. Replaceable motor driver, support 4988 driver and 8825 driver. Circuit board using high-quality 4-layer board, and specially dealing with thermal optimization; ramps is a 2-layer board. Using high-quality MOSFET tube, with better heat dissipation. Using a dedicated power chip to support 12V-24V power input, to solve the problem of Ramps voltage converted into chip heating. To accept 24V input, hot bed current can be reduced to 1/4 under the same system power, effectively solve the heating problem of hot bed MOS tube. Firmware can use open-source firmware Marlin, and its configuration is exactly the same as ramps1.4, which can directly replace Ramps1.4. Can directly connect to Ramps1.4,2004LCD control board and 12864LCD control board. Set aside the motor pulse and direction output port, convenient to facilitate external high current to connect external high current (such as 2A, 5A) motor drive circuit. Reserve the Servos, AUX-1, AUX-2 interfaces on Ramps1.4, providing three 5V output, three 12V output interface. This board is an upgrade part of the MKS Gen V1.2 board, improving the performance of power protection and USB communication stability.